"Blue 1" redirects here. For the airline, see Blue1. Not to be confused with Coomassie Brilliant Blue. Brilliant Blue FCF (Blue 1) is an organic compound classified as a blue triarylmethane dye, reflecting its chemical structure. Known under various commercial names, it is a colorant for foods and other substances. It is denoted by E number E133 and has a color index of 42090. It has the appearance of a blue powder. It is soluble in water, and the solution has a maximum absorption at about 628 nanometers. It is a synthetic dye produced by the condensation of 2-formylbenzenesulfonic acid and the appropriate aniline followed by oxidation. It can be combined with tartrazine (E102) to produce various shades of green. It is usually a disodium salt. The diammonium salt has CAS number 3844-45-9. Calcium and potassium salts are also permitted. It can also appear as an aluminum lake. The chemical formation is C37H34N2Na2O9S3. Related dyes are C.I. acid green 3 (CAS#4680-78-8) and acid green 9 (CAS#4857-81-2). In these dyes, the 2-sulfonic acid group is replaced by H and Cl, respectively. 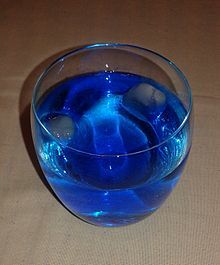 As a blue color, Brilliant Blue FCF is often found in cotton candy, ice cream, canned processed peas, packet soups, bottled food colorings, icings, ice pops, blueberry flavored products, children's medications, dairy products, sweets soft drinks, and drinks, especially the liqueur Blue Curaçao. It is also used in soaps, shampoos, mouthwash and other hygiene and cosmetics applications. In soil science, Brilliant Blue is applied in tracing studies to visualize infiltration and water distribution in the soil. In the United States, of the two approved blue dyes (the other being Indigo carmine, or FD&C Blue #2), Brilliant Blue FCF is the more common of the two. In the United Kingdom, Smarties chocolates were colored with Brilliant Blue FCF (top) until 2008, later being replaced with a natural spirulina coloring (bottom). The dye is poorly absorbed from the gastrointestinal tract and 95% of the ingested dye can be found in the feces. When applied to the tongue or shaved skin, Brilliant Blue FCF can be absorbed directly into the bloodstream. Brilliant Blue FCF is an approved food colorant and pharmacologically inactive substance for drug formulations in the EU and the United States. It is also legal in other countries. It has the capacity for inducing allergic reactions in individuals with pre-existing moderate asthma. In 2003, the U.S. FDA issued a public health advisory to warn health care providers of the potential toxicity of this synthetic dye in enteral feeding solutions. The following legal limits apply in the EU (E 131) and other countries: 150–300 mg/kg depending on the type of food. Safety limit for foods and drugs: 0.1 mg/day per kg body weight. The ADI for Brilliant Blue FCF is 6 mg/kg. Scientists who were conducting in-vivo studies of compounds to lessen the severity of inflammation following experimental spinal cord injury had previously tested a compound called OxATP to block a key ATP receptor in spinal neurons. However, OxATP has toxic side effects and must be injected directly into the spinal cord; in searching for alternatives they noted that Brilliant Blue FCF has a similar structure. This led them to test a related dye, Brilliant Blue G (also known as Coomassie Brilliant Blue) in rats, which improved recovery from spinal cord injury while temporarily turning them blue. ^ "Erioglaucine disodiumsalt" (PDF). Acros Organics. Retrieved 10 March 2016. ^ El Ali, Bassam M.; Bassam El Ali; Ali, Mohammad Farahat (2005). Handbook of industrial chemistry: organic chemicals. New York: McGraw-Hill. ISBN 978-0-07-141037-3. ^ "LISTERINE Antiseptic Mouthwash, SMART RINSE, WHITENING, ADVANCED, Fluoride Rinse, and Tartar Protection Products". Listerine.com. Archived from the original on 2011-01-02. Retrieved 2009-07-31. ^ Lucová, Marianna; Hojerová, Jarmila; Pažoureková, Silvia; Klimová, Zuzana (2013-02-01). "Absorption of triphenylmethane dyes Brilliant Blue and Patent Blue through intact skin, shaven skin and lingual mucosa from daily life products". Food and Chemical Toxicology. 52: 19–27. doi:10.1016/j.fct.2012.10.027. porcine tongue dorsum was exposed to human saliva with 15,000 ng/cm2 of dye for 20 min. 24-h diffusion resulted in 34 ng/cm2 of BB and 86 ng/cm2 of PB which can be directly absorbed into the blood system. ^ Peng, Weiguo; Maria L. Cotrinaa; Xiaoning Hana; Hongmei Yua; Lane Bekara; Livnat Bluma; Takahiro Takanoa; Guo-Feng Tiana; Steven A. Goldmanb; Maiken Nedergaard (July 28, 2009). "Systemic administration of an antagonist of the ATP-sensitive receptor P2X7 improves recovery after spinal cord injury". Proceedings of the National Academy of Sciences of the United States of America. 106 (30): 12489–12493. doi:10.1073/pnas.0902531106. PMC 2718350. PMID 19666625. Retrieved 1 April 2010. W. H. Hansen; O. G. Fitzhugh; A. A. Nelson; K. J. Davis (1966). "Chronic toxicity of two food colors, Brilliant Blue FCF and Indigotine". Toxicology and Applied Pharmacology. 8 (1): 29–36. doi:10.1016/0041-008X(66)90097-4. PMID 5950860. J. F. Borzelleca; K. Depukat; J. B. Hallagan (1990). "Lifetime toxicity/carcinogenicity studies of FD & C blue No. 1 (Brilliant blue FCF) in rats and mice". Food and Chemical Toxicology. 28 (4): 221–235. doi:10.1016/0278-6915(90)90034-K.
J. P. Brown; A. Dorsky; F. E. Enderlin; R. L. Hale; V. A. Wright; T. M. Parkinson (1980). "Synthesis of 14C-labelled FD & C blue no. 1 (brilliant blue FCF) and its intestinal absorption and metabolic fate in rats". Food and Cosmetics Toxicology. 18 (1): 1–5. doi:10.1016/0015-6264(80)90002-4.